Since the introduction of Conroe/Merom back in 2006 Intel has been prioritizing notebooks for the majority of its processor designs. The TDP target for these architectures was set around 35 - 45W. Higher and lower TDPs were hit by binning and scaling voltage. The rule of thumb is a single architecture can efficiently cover an order of magnitude of TDPs. In the case of these architectures we saw them scale all the way up to 130W and all the way down to 17W. 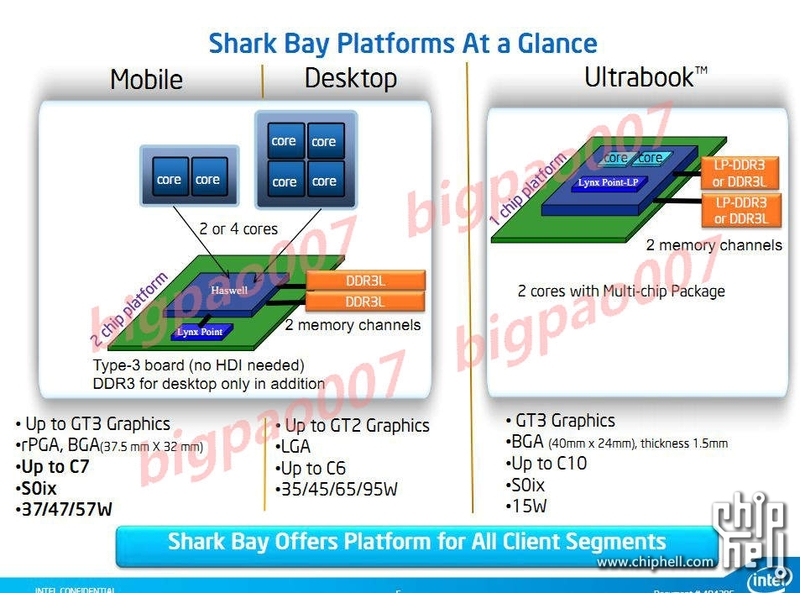 In the middle of 2011 Intel announced its Ultrabook initiative, and at the same time mentioned that Haswell would shift Intel's notebook design target from 35 - 45W down to 10 - 20W. At the time I didn't think too much about the new design target, but everything makes a lot more sense now. This isn't a "simple" architectural shift, it's a complete rethinking of how Intel approaches platform design. 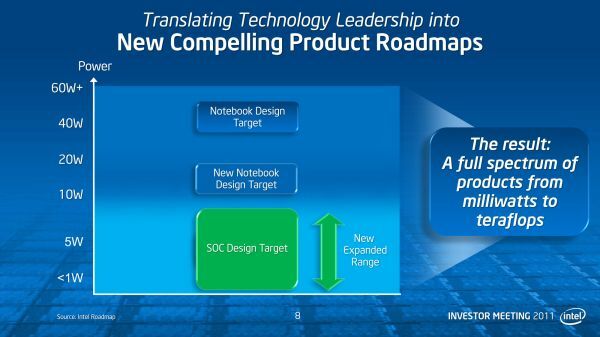 More importantly than Haswell's 10 - 20W design point, is the new expanded SoC design target. I'll get to the second part shortly. There will be four client focused categories of Haswell, and I can only talk about three of them now. There are the standard voltage desktop parts, the mobile parts and the ultra-mobile parts: Haswell, Haswell M and Haswell U. 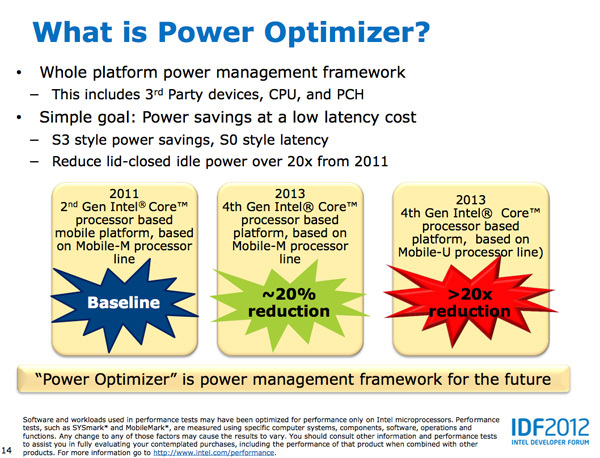 There's a fourth category of Haswell that may happen but a lot is still up in the air on that line. Of the three that Intel is talking about now, the first two (Haswell/Haswell M) don't do anything revolutionary on the platform power side. 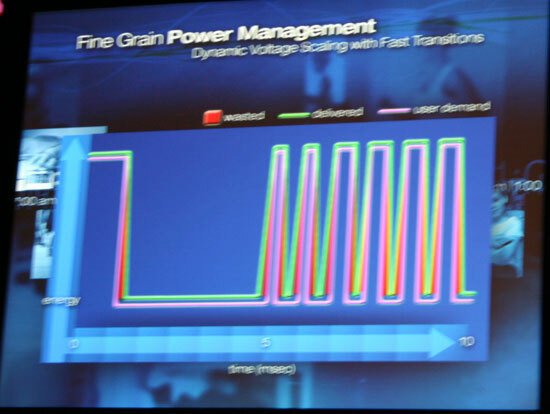 Intel is promising around a 20% reduction in platform power compared to Sandy Bridge, but not the order of magnitude improvement it promised at IDF. These platforms are still two-chip solutions with the SoC and a secondary IO chip similar to what we have today with Ivy Bridge + PCH. It's the Haswell U/ULT parts that brings about the dramatic change. 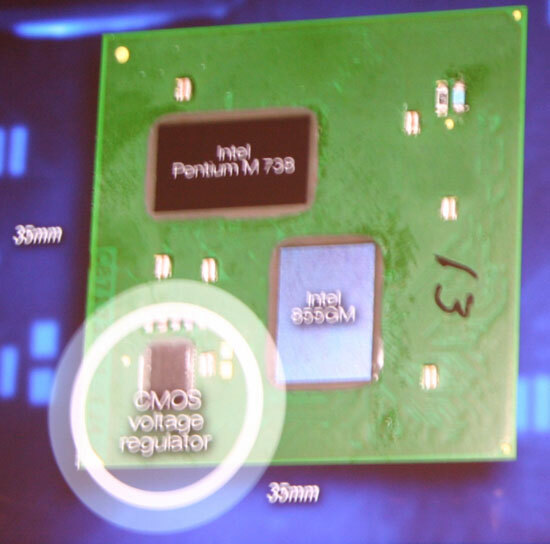 These will be a single chip solution, with part of the voltage regulation typically found on motherboards moved onto the chip's package instead. There will still be some VR components on the motherboard as far as I can tell, it's the specifics that are lacking at this point (which seems to be much of the theme of this year's IDF). 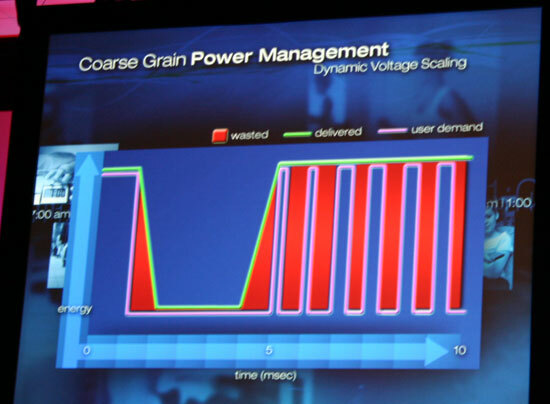 The benefits were two-fold: 1) Intel could manage fine grained voltage regulation with very fast transition times and 2) a tangible reduction in board component count. 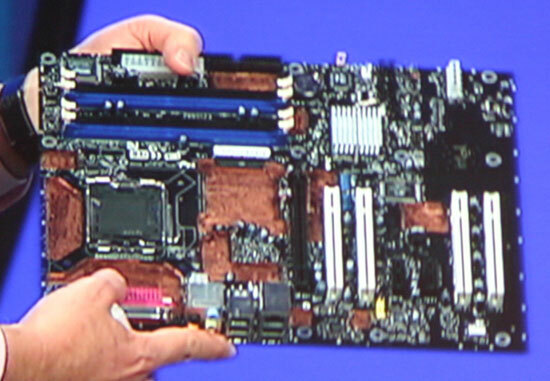 2005 - A prototype motherboard using the technology. Note the lack of voltage regulators on the motherboard and the missing GMCH (North Bridge) chip. The second benefit is very easy to understand from a mobile perspective. Fewer components on a motherboard means smaller form factors and/or more room for other things (e.g. larger battery volume via a reduction in PCB size). The first benefit made a lot of sense at the time when Intel introduced it, but it makes even more sense when you consider the most dramatic change to Haswell: support for S0ix active idle.